Want a free Pilates workout? There really isn’t much free in this world anymore, especially when it comes to specialized exercise programs. In this article I will be presenting you some basic principles of beginning your free Pilates workout. It is very important to understand that Pilates is a mind body exercise program and so you need to be able to connect and feel what is happening in your body as you do your Pilates workout. Because Pilates exercise principles focus on breathing, form, and concentration, these are the 3 key areas we will focus your Pilates workout on. This will give you a solid foundation to understanding and better preparing for more Pilates work later. To get started with your Pilates workout lie on your exercise mat with your arms at your sides or around your rib cage as shown, and your legs can be bent or stretched out long. Begin your Pilates breathing deeply into your nose and feeling your ribcage expand to the sides and into your back. As you exhale through your mouth long and slowly pushing all the air out feel yourself getting smaller around your waist and abdomen as you expel the air completely. Do this beginner Pilates exercise 10 times. You can imagine you are a balloon that is inflating as you inhale deeply and deflating as you are expelling all of the air out. The exhale should be longer than the inhale. While you are still breathing feel the form of your body as you lie on your mat. During your free Pilates workout you may need to close your eyes sometimes to feel your body position better. Imagine your tailbone heavily anchored on the mat, a natural curve in your lumbar spine, your mid ribcage area pulled into the mat, a natural curve in your neck, and your chin pulled down to feel length in the back of your neck. Continue with the above breathing technique as you imagine this imprint of your body on the mat. 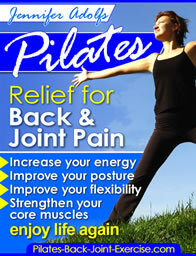 Beginner Pilates DVD for Healthy Back and Joints. As you continue the above exercise concentrate on the position of your hips in relation to your abdomen. Place your hands on your hip bones and make sure they do not move as you exhale. Think about drawing your belly button down and into your spine without actually moving the skeleton, only the abdominal muscles. Once you begin to connect your mind with the feel of your body moving you will enjoy your beginner Pilates exercises more and more. It leaves you feeling energized, taller, and more exhilarated. If this free Pilates workout leaves you wanting more then check out all the exercises in the new Pilates ebook available here today!